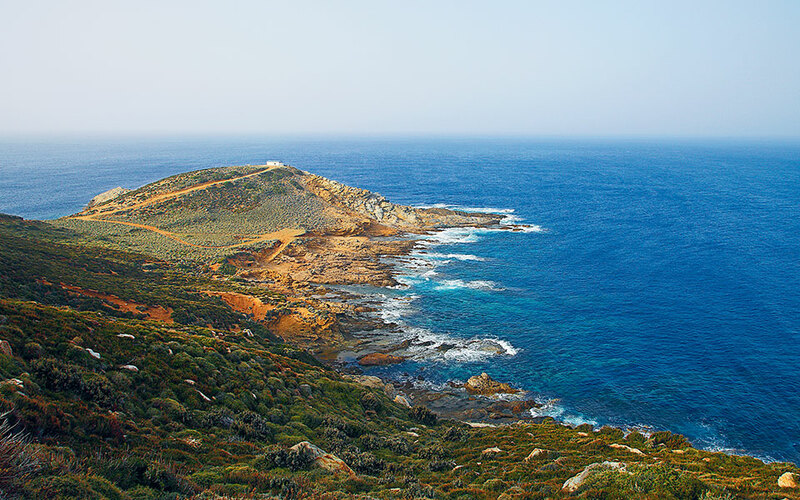 This route takes you through a rugged landscape of rocky slopes plunging into wild seas and ultimately to the legendary Cavo d'Oro - aka Cape Kafireas. The legendary Cape Kafireas, or Cavo D’Oro is 60 km from the town of Karysto on Evia, a drive that – without stops – takes about 2 hours. Until just a few years ago, most of the route was along a dirt road. Today you won’t drive more than 10km along a dirt track, but the route demands a car with a high clearance and good tires. The route runs alongside the sea and beneath the slopes of Mount Ochi where, according to myth, Hera and Zeus made love. The mountain is also home to a forest of chestnut trees, many of which are centuries old and resemble sculptures; on the peak, reachable via a 1.5 hour hike, is the church of Profitis Ilias and the most impressive of the region’s mysterious drakospita (“dragon-houses”). 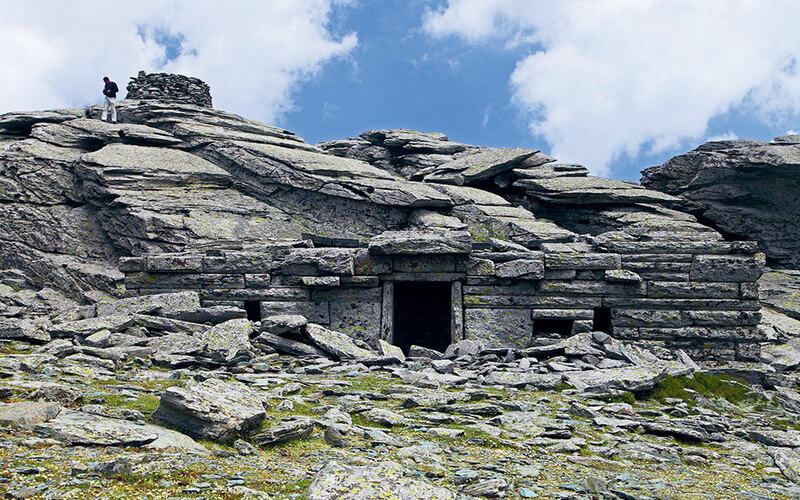 These are structures made with large blocks of stone and without the use of mortar, whose builders remain unknown. Along the route to Cavo D’Oro you will encounter mainly wild goats and wind generators, you will see seabirds gliding above you and rocky slopes descending into the sea. The roar of the wind and the waves, the scent of thyme, and the villages with populations in the single digits all together make up a wonderful route on the fringe, a journey out of the ordinary. There are no gas stations so make sure to fill up in Karystos, nor are there tavernas and guesthouses. For all its wild beauty, this area is not at all touristic. It is worth taking your the first detour 6km after the village of Metochi in order to reach the chestnut forest, the refuge of Ochi and the path to the dragon house. Take a second detour at Platanisto, the last “living” village in the area in order to see its two stone bridges, its waterfall and watermill. From here a route begins for the beach of Potami, where on the the weekends you are likely to find the taverna run by the Kalogirou family open (tel. +30 22240-22327). The village of Andia is home to about 30 people, who will happily talk to you about their famed sfyria, a rare language made up entirely of whistles; it has individuals letters, syllables and even different intonations, and the local cultural association is attempting to preserve it from extinction. If you are lucky you will even hear locals conversing in it – at first you will likely confuse it with birdsong. The next villages you will come to – Evangelismos, Kapsouri, Drymonari, Thymi, Xaharia, Vrestides, Prinia – are almost entirely deserted. You will be lucky to encounter one or two people. Amygdalia has only 30 residents, mostly fishermen who ply the mysterious and perpetually rough waters off Cavo D’Oro. The asphalt ends at the village of Zacharia, but the road remains passable. Keep right at all of the intersections and after Prinia, drive on the narrow, rough dirt road, full of broken rocks which, despite being only 3km long, seems never-ending. This will lead you to the famed cape with its little church of Aghios Grigoris and the rock known as Arapi with its lighthouse. 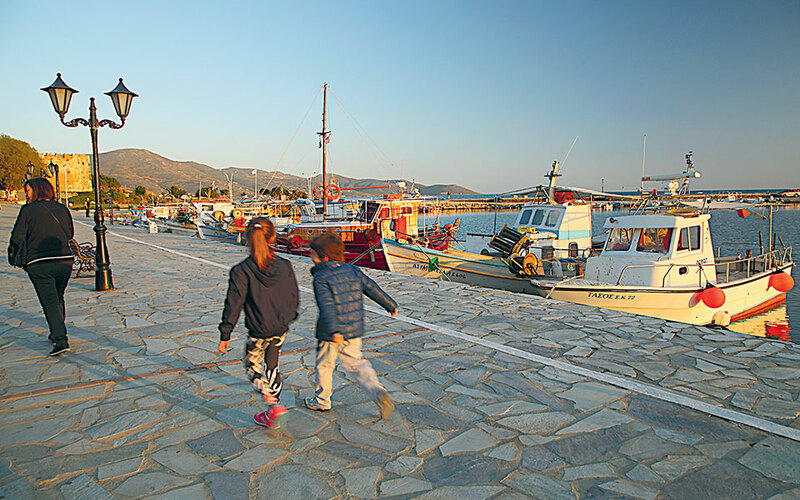 At this southeasternmost point of Evia, the legends and the wind are simply enchanting. If you keep left at Prinia , you will come upon an incredible 15 km dirt road on top of the cliffs of the eastern coast of Evia which leads to the village of Agatho. In the winter it is usually impassable even by 4x4s. But if you manage to follow it you will reach two famous beaches, Kallianos and Aghios Dimitrios, backed by lush green gorges. The village of Aghios Dimitrios boasts an exceptional taverna, that of Stefosi (tel. +30 22240-71219). From there you can return towards Marmari and Karysto, completing an effectively circular route. The proposed route, from Karysto to Cavo D’Oro, is 60km long.